Evoforce wrote: I created an electric full size folder but have had some unfortunate things happen and haven't been able to ride in a while. Have several others too! A very practical and fun form of transit! I think the often-shared folding electric scooters that are now appearing in cities all over the place are excellent first/last mile vehicles, especially for people who have to wear business attire to work and can't get all sweaty. They're also easy to carry on mass transit. 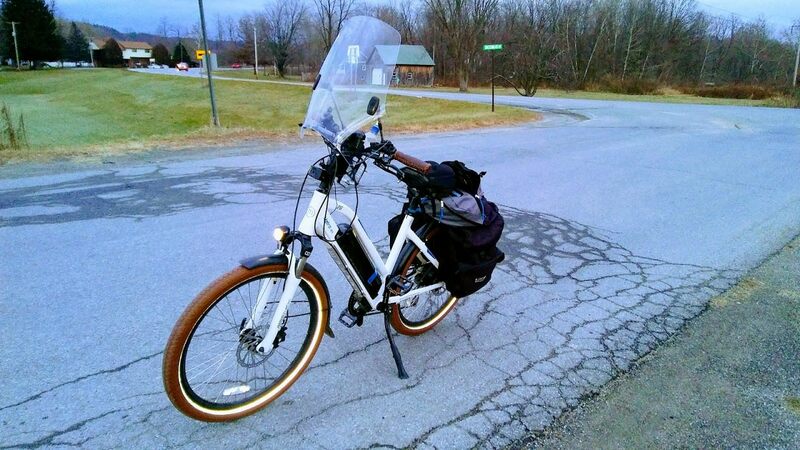 e-Bikes strike me as best suited for longer trips. I just got back from a 16 mile, 1 hour ride (yes, that's an average speed of 16MPH, even with two rest stops). It's really hard to take a short ride on this bike. LeftieBiker wrote: I just got back from a 16 mile, 1 hour ride (yes, that's an average speed of 16MPH, even with two rest stops). It's really hard to take a short ride on this bike. Yes, I always enjoy it and get an EV grin and want to keep going! I agree! Some problems to contend with though are stupid laws that require pedals in a lot of States. So... can't be in the bike lane without pedals and can't be in the sidewalk either as a motorized toy. New York defined electric bicycles out of existence decades ago with DMV regs that ban them, but that is on hold in most places (except those with their own e-bike bans in place) while the Legislature tries to pass a law legalizing them in some form. . . .The fly folding system makes the bike collapsible and ready to carry in just 1 second. It has an aluminium frame and a total weight of 55 lbs. The 250 watt rear-wheel motor can propel you 40 miles on a full charge. Gi fly meets global e-bike regulations. Top speed with the highest level of electrical assistance is 15 mph. A faster speed can be achieved by pedaling. The bike's smartphone connectivity feature charges your phone and provides directions. There's even an app-controlled locking system which secures your bike when you're 10 ft away. The Gi Fly costs $3,390. I've been meaning to put together a Winter E-Bike from a New Old Stock EZIP Trailz I have. Grippier tires, windshield, and the one PAS speed it has is quite a bit slower than the ridiculous 12.5MPH my Magnum Metro does at its lowest PAS setting. I've had to use the Metro's thumb throttle most of the time to lower the windchill. Alas, I always wait too long for these projects, and the garage is now too cold. So I got a universal motorcycle windshield from Ebay, and after only 90 minutes of doing a 20 minute installation (the bar clamp bolts are 1mm too short) I now have a bike that's too fast in the cold but doesn't blast me with frigid air quite as much. Can people see the image by clicking on this link? Anyone know how to embed a Google Drive link to just show the image? Sigh. This sort of thing was happening decades ago in Amsterdam with the white bikes being dumped in canals, has been happening elsewhere, and is now spreading to e-scooters. Some human behavior seems to be a constant across all cultures - if something is low cost or free and ubiquitous, some people will treat it like garbage.